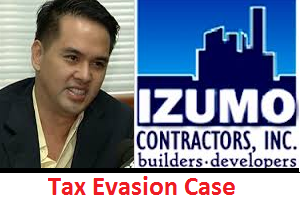 March 27, 2014; The Bureau of Internal Revenue (BIR) filed a case against Cedric Lee's company Izumo Contractors for attempted P194 million tax evasion by underdeclaring their income from 2006 to 2009. According to ABS-CBN news, the following names were included in the tax evasion complaints; business man Cedric Lee - as president and and CEO of Izumo, John K. Ong - the company's chief operating officer, and Judy Gutierrez Lee -the chief financial officer. In relation with the issue involving Cedric Lee's statemets in mauling of TV-host and actor Vhong Navarro during his TV interview, he denied that he tried to extort money from Navarro because he don't need money and further mentioned that he have lot of business where he earned enough money for his needs. This statement triggers BIR chief Kim Henares curiosity to take deep reviews on all companies were Lee is connected if he is declaring right taxes. Until today, there is no update yet on issues related to Vhong Navarro, Deniese Cornejo, Cedric Lee, Zimmer Rance, and all other personnel related controversial case happened last January 22, 2014. Netizen are still looking for answers and waiting for right justice to real victim/s of said case. Be updated on mauling of Vhong Navarro here. Speak up your mind by posting comment below, thanks.